This swift 28ft Carolina Classic powered by twin engine 315HP turbo diesels out of Pez Vela marina in Quepos has experienced American Captain Ronnie Schwenk at the helm, assisted by a bilingual mate. 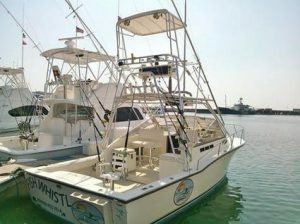 She has a fly bridge, outriggers, fighting chair, marine head, tuna tubes, live well and built-in coolers. The boat carries a complete range of the latest Penn/Finnor/Shimano rods and reels; full electronics, including GPS/sonar; and all the necessary safety equipment. Lunches on this boat are special!